The National Portrait Gallery tells the multifaceted story of the United States by presenting portrayals of individuals who have shaped the nations’ history and culture. The museum was established by an Act of Congress in 1962 and opened to the public Oct. 7, 1968. Its charter was to collect and display images of “men and women who have made significant contributions to the history, development and culture of the people of the United States.” For nearly 50 years, the National Portrait Gallery has presented the stories of individuals who have shaped America through visual biographies spanning the visual arts, performance and new media. The museum’s collection holds more than 23,000 works, including the only complete collection of presidential portraits outside the White House. The National Portrait Gallery is housed in the Donald W. Reynolds Center for American Art and Portraiture, a National Historical Landmark that formerly served as the Old Patent Office in 19th century. 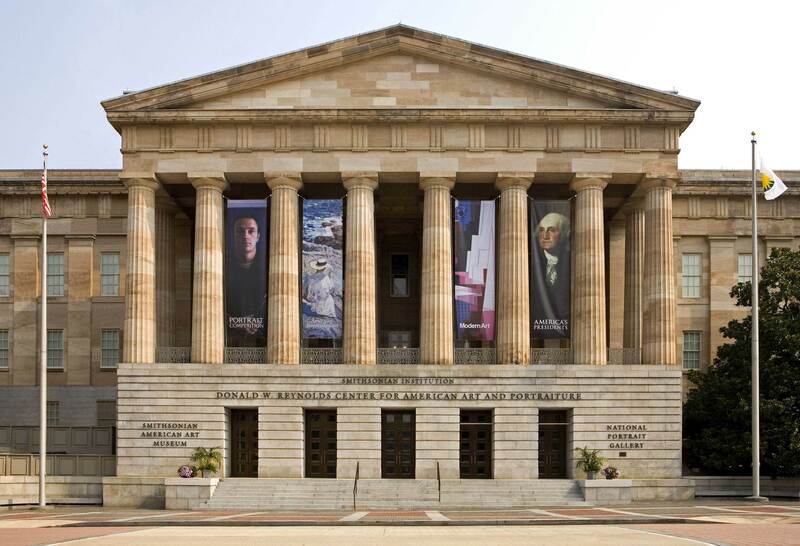 The Portrait Gallery shares its home, known for its Greek revival architecture and elegant Robert and Arlene Kogod Courtyard designed by Fosters+Partners, with the Smithsonian American Art Museum in Washington, D.C. The National Portrait Gallery is a bilingual institution and a member of the Smithsonian Institution. The museum has a vigorous schedule of special exhibitions that rotate throughout each year. Long-term permanent collection exhibitions include “America’s Presidents,” “American Origins,” “Twentieth-Century Americans” and “The Struggle for Justice.” The “One Life” is dedicated to a focused biography of one individual, while the museum’s third-floor mezzanines along the building’s historic Great Hall—at one time the largest room in America and the site of Lincoln’s second inaugural ball—contain the exhibitions “Bravo!” and “Champions,” which are devoted to those in the performing arts and sports, respectively. The museum started its “Portraiture Now” series dedicated to contemporary artists in 2007 followed by “IDENTIFY: Performance Art as Portraiture” in 2015, and hosts a choreographer-in-residence. The National Portrait Gallery is also the organizer of the Outwin Boochever Portrait Competition to encourage the next generation of artists working in portraiture and presents several touring exhibitions throughout the year. The National Portrait Gallery commissions significant new work, including portraits of past presidents and first ladies upon their departure from office and public art and performances celebrating the genre of portraiture. In 2014, the National Portrait Gallery commissioned Cuban American artist Jorge Rodríguez-Gerada’s “Out of Many, One,” a temporary public art installation that stretched more than six acres of land along the National Mall. The National Portrait Gallery offers a variety of programs, including free lectures, hands-on educational activities, performances and films. The Portrait Gallery also presents teacher workshops, family days and guided tours—including accessible programs—for thousands of people each year. The National Portrait Gallery is part of the Donald W. Reynolds Center for American Art and Portraiture at Eighth and F streets N.W., Washington, D.C. Connect with the museum at npg.si.edu, Facebook, Instagram, blog, Twitter and YouTube.